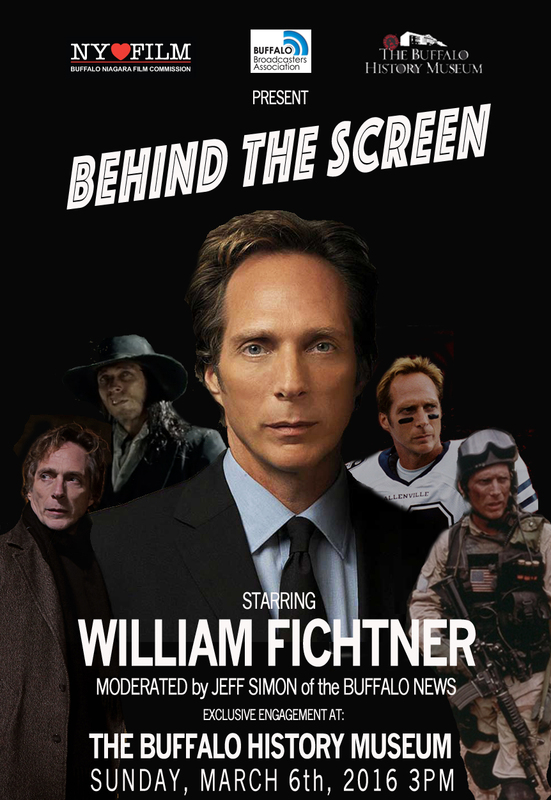 (July 17, 2016) Back in March of this year Buffalo actor William Fichtner returned home for a special “Behind The Screen” presentation at the Buffalo History Museum. The event was sponsored by the Buffalo Niagara Film Office, The Buffalo Broadcasters and the Buffalo History Museum. Jeff Simon of the Buffalo News moderated an hour long Q and A session with Bill, and the video results were documented and produced by students studying in the Hilbert College department of Digital Media and Communication through their new immersive learning initiative. The Hilbert College immersive learning initiative brings together student-driven teams directed by faculty mentors to create high-impact learning experiences. Through immersive learning, students earn credit for working collaboratively with businesses, nonprofits, and state agencies to address community challenges. Students involved were David Seifert, assistant camera and editor; Nick Miller, editor, Chris Gallant, faculty mentor and director. Behind the Screen: William Ficthner at the Buffalo History Museum March 6th, 2016 from Hilbert College DMAC on Vimeo.